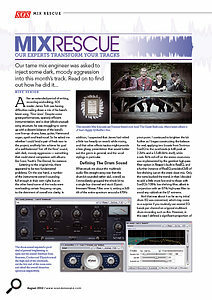 I’ve found your Mix Rescue articles really useful, but I was struck by how much detail Mike Senior goes into. I get why he does it, but I don’t have a feel for how long it takes. If I’m mixing like this, should I be spending hours, days, weeks, or what? SOS contributor Mike Senior replies: I get asked this question frequently, but it’s difficult to answer in the abstract because the time required varies tremendously between projects. Sometimes I’ve spent more than two weeks mixing one song, but at other times I’ve finished three or four mixes in one day. Mix Rescue projects typically take between three and five days. SOS’s Mix Rescue features often go into huge amounts of detail, but a good proportion of the time and effort involved is often spent correcting issues that could have been more quickly corrected when writing or tracking. A pure mixing job should not take you more than a couple of days — and can often be completed much more quickly. Why the wide variation? My job is to turn the supplied multitracks into a finished product, and as the production values of ‘finished–sounding’ vary enormously depending on the style of music and its projected market, the amount of time required to reach that quality threshold inevitably varies too. In terms of pure mixing activities (processing, effects and fader moves), a sensibly recorded small acoustic session might need little more than simple balancing and panning to give a nicely representative organic sound, and therefore require only a few hours per song to complete. Large–scale chart–targeted productions, on the other hand, might require two or three days to make sense of a blizzard of different programmed and overdubbed sonic elements, while keeping the overall sonics within extremely tight mass–market stylistic tolerances in terms of mix tonality, short-/long–term dynamics, and vocal/hook intelligibility. The reason most Mix Rescue projects take longer is that they almost always involve more than just mixing work. For example, I usually end up spending a day or so editing, simply because most Mix Rescuees haven’t realised how carefully the leading releases in their target style manage timing and tuning issues. In many cases, the recordings demanded to implement a given style simply aren’t there either. I might get DI’d acoustic guitars where the genre calls for miked–up sounds, say, or there may be no appropriate double tracks/layers, or the electric guitars may be too distorted, or the drums may have had ancient worn–out heads... The list is endless, even before you add a truly inventive catalogue of inadvisable recording methods into the equation! Every one of these tracking–stage misjudgments costs the mix engineer time, either in trying to salvage something useful from what’s provided, or in working around crucial omissions. The time requirements really balloon where the project needs more creative production input. On a sonic level, if no–one has really committed to decisions about what the record should sound like during tracking, that leaves the mix engineer having to take a (more or less educated) guess, and that frequently involves a good deal of trial and error. The same applies if the arrangement or structure of the music aren’t serving the music well. Or if the artist is concerned that there simply isn’t enough melodic/harmonic interest in the parts as recorded, such that additional MIDI parts, recorded overdubs, or editing/mixing stunts become necessary to increase the amount of ear–candy.Hopefully that gives you some idea how long my Mix Rescue projects take. But, as I said, much of this time is spent on things other than actual mixing. In my view, a mix that takes me more than two days in any style raises serious questions about the recording and production techniques used prior to mixdown. While there are clearly many things that can be ‘fixed in the mix’, that’s an extraordinarily inefficient way of working if you have any alternative! I can’t tell you how often I’ve wished, while doing the Mix Rescue column, that I could travel back in time and ask the reader to spend just 10 more minutes doing something while tracking that would have saved me hours (quite literally) of remedial work. To quote Trevor Horn, “the mix is the worst time to do anything”!